← Win a FREE copy of DARK CITY LIGHTS on Goodreads! So begins an incredible M.J. Moore review of the magnificent 2014 book LIGHT OF THE DIDDICOY by Eamon Loingsigh. Check out the full review on NewWorldReview.com. 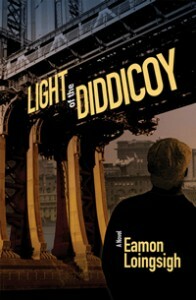 In case you’re wondering, LIGHT OF THE DIDDICOY is the brutal saga of Irish-American gangs on the Brooklyn waterfront in the early part of the twentieth century, told through the eyes of Irish immigrant Liam Garrity. Forced at age 14 to travel alone to America on the eve of the 1916 Easter Rising, Garrity stumbles directly into the hard-knock streets of the Brooklyn pier neighborhoods run by Bridge District gang The White Hand. In the industrialized enclaves where Famine Irish settled a generation earlier, Garrity has no choice but to use any means necessary to survive within the clan-like loyalties of the gang, and carve out his place in a no-holds-barred world of a community living outside the law. For more on the book, and its author, click here. LIGHT OF THE DIDDICOY is available directly through us here at Three Rooms Press.